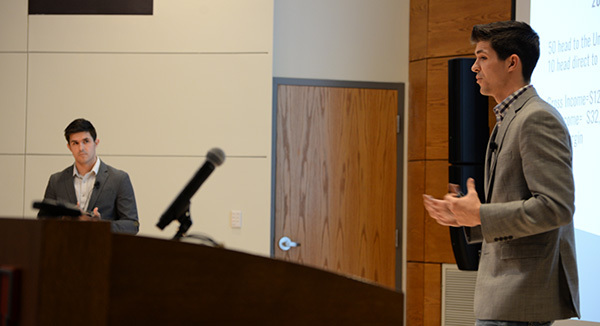 Joseph Brugger (left) and Matthew Brugger (right) pitch Upstream Farms to the judges during the final round of the competition. Dr. Sam Nelson, director of the Center for Entrepreneurship and assistant professor of practice in management, believes the annual competition gets better every year. He noted the magnitude of business ideas, from a start-up aiming to provide early cancer detection to an animal welfare project looking to save lives through a data management software program. The judges for the competition consisted of a diverse group of entrepreneurs, alumni and professionals. Paul Hogan ’85, chairman and co-founder of Home Instead Senior Care, was one of the judges for the final round of the competition. He was impressed by the ingenuity of the grand prize winners. Paul Hogan, chairman and co-founder of Home Instead Senior Care, questions the competitors on their plan. As one of the founders of Upstream Farms, Joseph Brugger, a junior applied science major from Albion, Nebraska, owes part of the company’s success to the university’s Engler Agribusiness Entrepreneurship Program. “Between Matthew and I, we have a lot of passions we know we want to do for the rest of our lives. We started this business not knowing what we wanted to do with it. The Engler program really helped us focus our passions and ambitions, and allowed us to turn them into a reality. And now after winning the New Venture Competition and listening to the feedback from the judges, we can take our business to the next level,” said Brugger. Lizz Whitacre, a senior management and pre-vet major from Eden Prairie, Minnesota, and one of the creators of Pawlytics, returned to the New Venture Competition for the fourth time this year. Her past experiences gave her more confidence when entering this year’s competition. “From my previous experiences pitching my products, I felt more comfortable this year when presenting. I focused on having beta users to show traction in the market, proving the product works and that we could do better than our competitors. I believe that translated into an easy-to-explain presentation the judges could take in. Overall, we received positive feedback, which feels great to know that we are on the right path,” Whitacre said. Brooke Lehman talks about Dwell Dinner & Co., a company she founded. An awards presentation and reception concluded the second day of the competition. Winners received plaques, commemorative coins and a giant check noting their winnings. The night ended with networking between competitors and judges. “It’s exciting to see students come up with innovative ideas and apply them to relevant industries,” said Hogan. “What stands out to me about this competition, is it’s not a one-and-done thing. If you’re serious about being an entrepreneur, you learn from your experiences, come back and you won’t give up. Grand Prize ($25,000): Justin Collier, a senior computer science major from Lincoln, Nebraska, and Whitacre. Pawlytics is a data management software for animal welfare organizations that can assist in saving the lives of companion animals. Grand Prize ($25,000): Brugger, and Matthew Brugger, a junior applied science major from Albion, Nebraska. The Brugger brothers run Upstream Farms, which sells agriculture products, as well as does consulting and provides seed solutions to farmers. First Runner-Up ($10,000): Brooke Lehman, a senior advertising and public relations major from Lincoln, Nebraska. Dwell Dinner & Co. creates spaces for people to make connections through the use of meals, speakers and other numerous activities. Second Runner-Up ($7,500): Trevor Fellbaum, a sophomore computer science major from Bellevue, Nebraska; Joshua Jones, a junior economics and computer science major from Omaha, Nebraska; and Joey Lydiatt, a sophomore management major from Bellevue, Nebraska. NovocAI is a diagnostic software used to detect cancer quickly with the assistance of artificial intelligence. Thomas G. Guy Startup Team Award ($2,500): Kaitlyn Hundt, a sophomore management major from Lincoln, Nebraska; Kristen Mohr, a junior management major from Butte, Nebraska; and Johanna Snodgrass, a junior marketing major from Bellevue, Nebraska. Frizz Free is a hair care product used to manage the “frizziness” of hair on dry weather days.